Happy New Year! 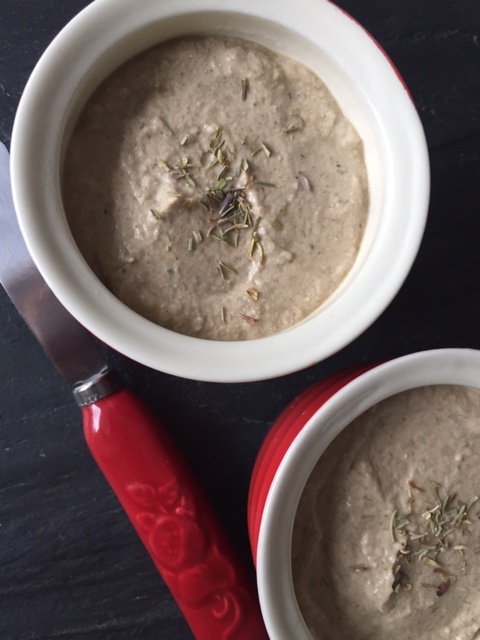 After a long relaxing Christmas break I’m back with my first post in almost a month – and of course I wanted to start the year sharing by an extra nutritious recipe. It’s always a huge bonus when an ingredient you love to feast on is also packed with health benefits. Mushrooms for me are one of those foods. I’ve always enjoyed the taste of mushrooms but it was only in writing up a fairly recent post for mushroom meatballs that I came to appreciate their unique health benefits. Since then I’ve been making a conscious effort to get more mushrooms into my diet – hence this mushroom pâté. As well as high doses of B vitamins, potassium and Vitamin E mushrooms also contain selenium. In the fruit and vegetable world the mineral selenium can only be found in mushrooms and spinach – it’s an anti-oxidant that means mushrooms have anti-aging properties. The nutritional benefits don’t end there – mushrooms are said to be the only vegan source of vitamin D, a vitamin associated more commonly with the sun that’s protective against health conditions including cancer. Perhaps your health goals for 2017 include eating less meat, boosting your vitamin D intake or preparing more meals from scratch. 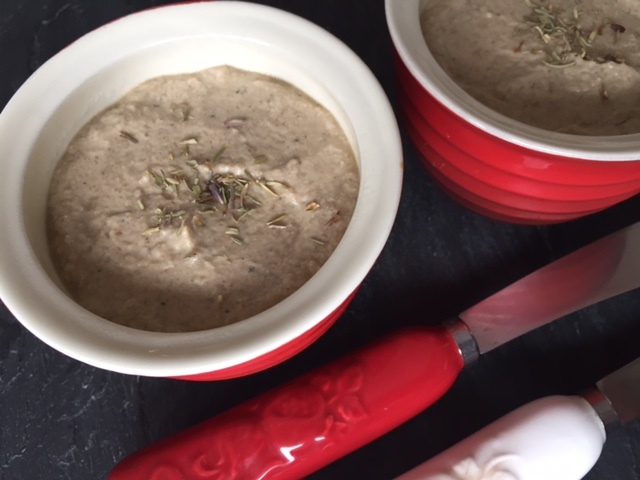 If so then this mushroom pâté could be a winner for you. It’s delicious, nutritious, and best of all takes only a few minutes to whip up with a few simple ingredients. The added bonus is that it keeps in the fridge for up to 5 days. Soak the porcini mushrooms in 2 tbsp boiling water and put to one side. Melt the butter in a saucepan, then add the fresh mushrooms, thyme & garlic. Cook the mushrooms on a medium heat for 10 minutes or until they are soft. Add the porcini mushrooms and their soaking juices and turn off the heat. Stir through the quark (or cottage cheese) and allow to cool for a few minutes. Blend the mixture with a hand blender into a smooth consistency. Transfer to single serving bowls and transfer to the fridge for an hour or so to set. This pâté is going to be a regular on my 2017 weeknight rotation. If you’re a mushroom fan then I’d encourage you to give it a go! Tags: mushroom, pâté, recipe, vegetarian. Bookmark the permalink. I love mushrooms but didn’t really know about their nutritious benefits. Thanks for sharing this recipe! I assume a recipe for mushroom soup would be very similar ingredient wise. This looks amazing. I’m a huge mushroom fan, myself! Really love your blog and am excited to be following now. I wanted to reach out and invite you to take a look at my new blog: http://christinanifong.com If you like what you see, please sign up for my weekly email newsletter in the sign up box you’ll find here: http://christinanifong.com/category/blog/ Thanks for taking a look! Thanks, Laura. Hope you like it! I love mushrooms and this pate looks delicious! I did not know the vitamin D benefit of mushrooms. This is such a great share! I am going to make the pate soon- love all teh flavors in it! Thanks Sandhya – I’m so glad you like it and yes mushrooms are such a surprise when it comes to vitamin D – a good way to get a boost without needing the sun! Yes Linda – the break was lovely and it was nice to switch off all things digital for a couple of weeks! Ahhh! This looks delicious! I love mushrooms, but never had them in pate form. This is a must try! Thanks Jhuls and yes mushrooms work really well as pate and it’s so good for you too. Let me know how it goes if you give it a try! Thanks Petra! Yes this pate is great and the porcini mushrooms make all the difference too! Oh but does this sound good. I love mushrooms and they have a lot of anti inflammatory agents, too! I LOVE mushrooms. Definitely a keeper! Thanks – glad you like the recipe! This sounds lovely. What a wonderful idea of making pate with mushrooms. 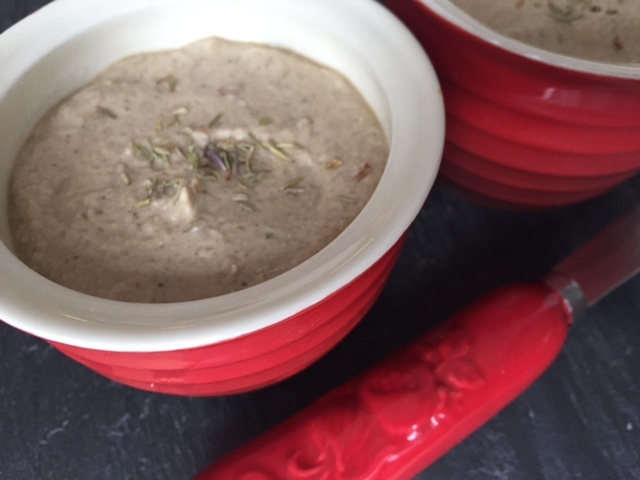 I love pork pate, so I can’t wait to try this – yum! Thanks Lily – and mushrooms are so good for you too! Oh my god – I love you! Thank you for this! I’m a mushroom fanatic!! !